It’s a hot summer morning; the coffee machine is preparing your favourite cup of Joe while the bed is being made. You pick out your ensemble for the day and enter your welcoming bathroom. Nothing can ruin this day, except the fact that the room is covered in dust, and to make matters worse, rays of sunshine are highlighting the imperfections. You can’t help but grimace at the sight of it. How can you fix this? Is there a solution? With the help of House Of Supreme and our problem-solving skills, we’re able to eliminate the mess from your life. Aluminium Shutters are the perfect solution for your bathroom mess. Now you may be asking, shutter in the bathroom not silly? Let us put your mind at ease by informing you about the many benefits of installing shutters in your bathroom. Here we go. Bathrooms contain high amounts of humidity, which can cause rotting wood and mould. With our Aluminium Shutters, you can kiss these problems goodbye, as the shutters are made from moisture resistant materials and powder coated with the finish to your liking adding a further layer of protection. We are now able to provide you with the best of both worlds, without the deteriorating effects. Is there anything worse than the feeling of being uncomfortable, whether it’s meeting your in-laws for the first time or feeling as though you’re being watched by strangers outside your home? By installing shutters in your bathroom, you’re at least eliminating one of the problems. 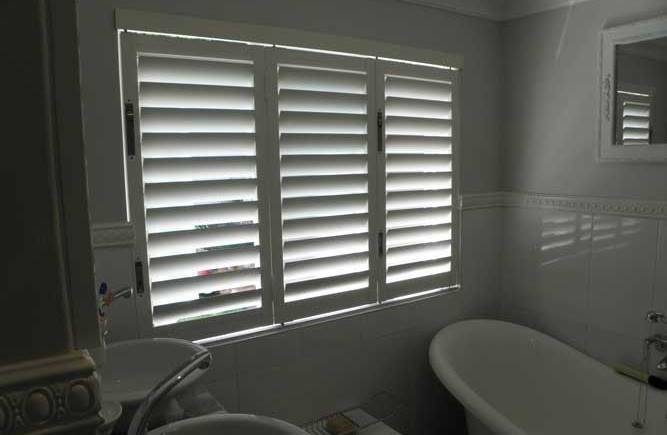 Due to the thickness and sturdy build of the shutters, you’ll have the complete privacy of your bathroom. Enjoy your space to its full potential. There is even a choice of installing Security Aluminium Shutters to add that additional barrier of security to your home. Gone are the days of spending hours cleaning window coverings. All it takes to clean this amazing product is a cloth and nonabrasive cleaning products. Swipe once, and you’re done, just like that. Cleaning a bathroom has never been this easy. You don’t have to spend a fortune for an attractive, reliable product. Our product is designed according to preference and fit. Choose your design, measurements and fit and we’ll handle the rest. Here at House of Supreme, we’ve got you covered. You don’t need to go on scavenger hunts and empty your bank account for a quality item. By installing Aluminium Shutters in your bathroom, you’re killing two birds with one stone. Make the smart choice, by purchasing this asset, and avoid unpleasant mornings for a lifetime. This entry was posted in Aluminium Shutters and tagged aluminium security shutters, Aluminium shutters.